Heading into the weekend with the best hummus spread I have ever made! 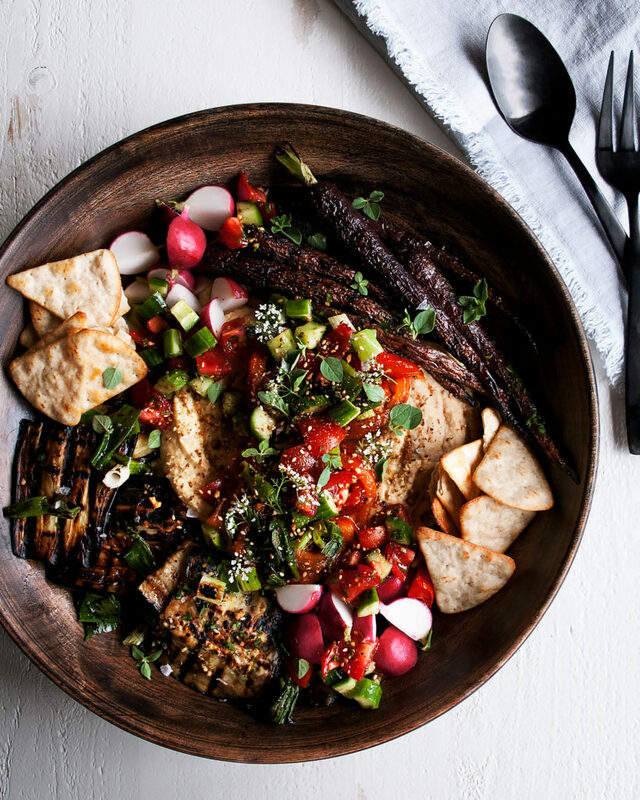 It’s a grilled vegetable hummus with all sorts of veggies, lots of herbs, really good olive oil, and of course some pita chips for dipping. YES. Here’s the thing, if I’m going to have hummus, I need it to be the ultimate hummus. Forget the concept of a few raw carrot sticks to use for dipping. 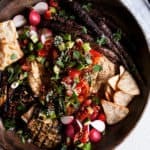 I want grilled vegetables, rich herby flavors, marinated tomatoes, definitely some cheese (I would use feta), and ideally homemade pita bread (but chips work, too). While I also love making most things from complete scratch, hummus is one of those things I never go through the extra step of soaking raw garbanzo beans. I always, always use canned beans. It’s just something I don’t find worth it…in terms of flavor or texture. I am perfectly content with using canned garbanzo beans, and I think it’s easiest for most people, too! So, the hummus is pretty standard. I didn’t have tahini on hand so threw in toasted sesame seeds instead, which really work just as well as tahini is simply ground sesame seeds. Whenever making any type of dip, I encourage you to rely on your own taste buds to determine both flavor and consistency. Need a little more salt or lemon juice? Add it. Not creamy enough? Add a little extra garbanzo bean liquid. Too salty? Add a splash of water. Dips are extremely easy to “bring back to life” in the sense that you can kind of just keep tweaking until it works for you. Same with this feta dip…which is another awesome one for summer if you’re having any parties soon! And then of course, you’ve got to add ALL of the things on top. 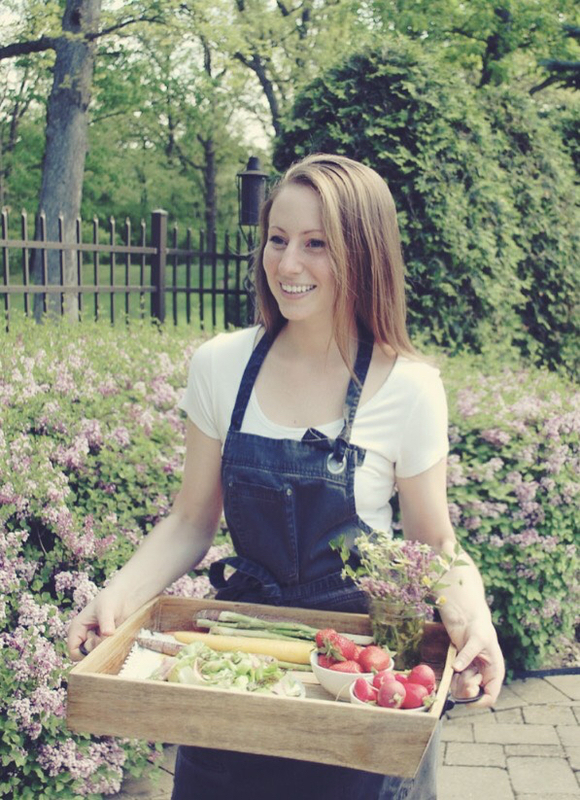 I love the combo of grilled/cooked vegetables with raw/crunchy vegetables. And the freshness from the herbs and olive oil? It is summer appetizer perfection! 1. Place the red peppers on the grill and let blacken on all sides. Coat the eggplant slices, green onions, and whole carrots with a generous amount of olive oil, season with salt, and grill on all sides until slightly charred and tender. 2. Remove all the vegetables. 3. Place the red peppers in a bowl and cover with foil for about 10 minutes to soften the skin. Peel the blackened skins off each red pepper, leaving the soft flesh. Sliced the peppers into strips. 4. Roughly chop the green onions. 5. In a small bowl, combine the cherry tomatoes, cucumbers, and parsley. Stir in enough olive oil just to coat the ingredients. Season with salt to taste. Set aside. 1. Add the drained garbanzo beans, garlic, and toasted sesame seeds to a food processor. Pulse until combined. 2. With the processor running, slowly add the garbanzo bean liquid, lemon juice, and olive oil. Process until creamy and smooth. 3. Season with salt to taste. Add more lemon juice or olive oil if needed. 4. 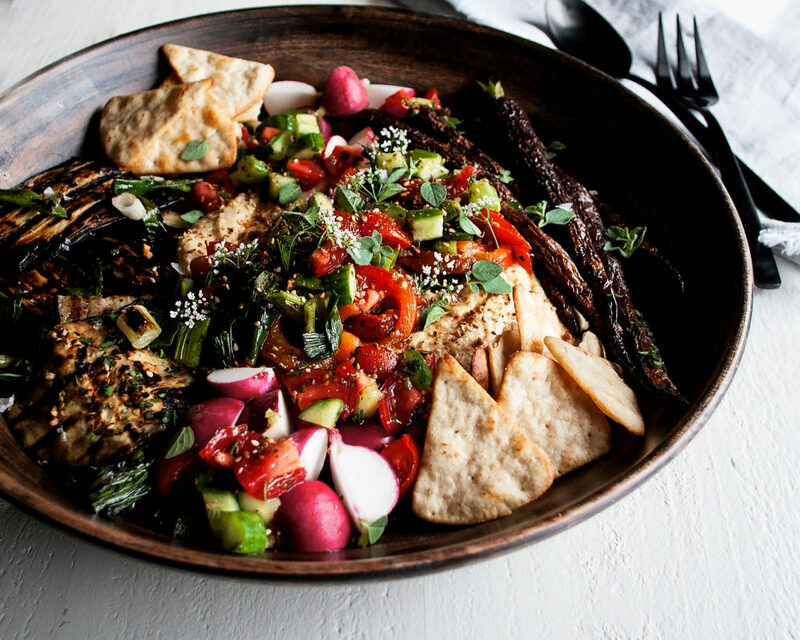 Serve the hummus in a large bowl or platter. 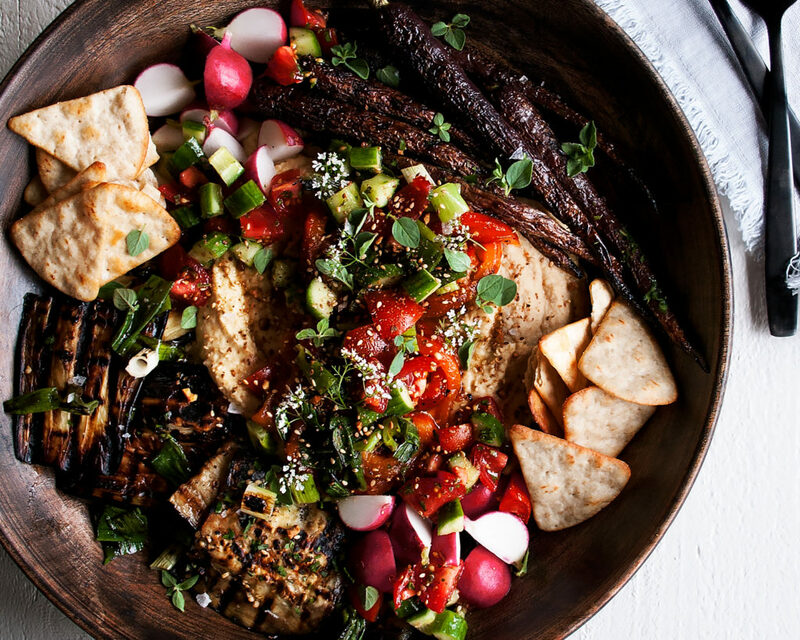 Arrange the grilled vegetables over top and spoon the tomato and cucumber salad onto the hummus. 5. Add the radishes and pita chips around the platter for dipping. Garnish with the oregano leaves, cilantro flowers, and more olive oil if desired.